My 3 Favourite Things! 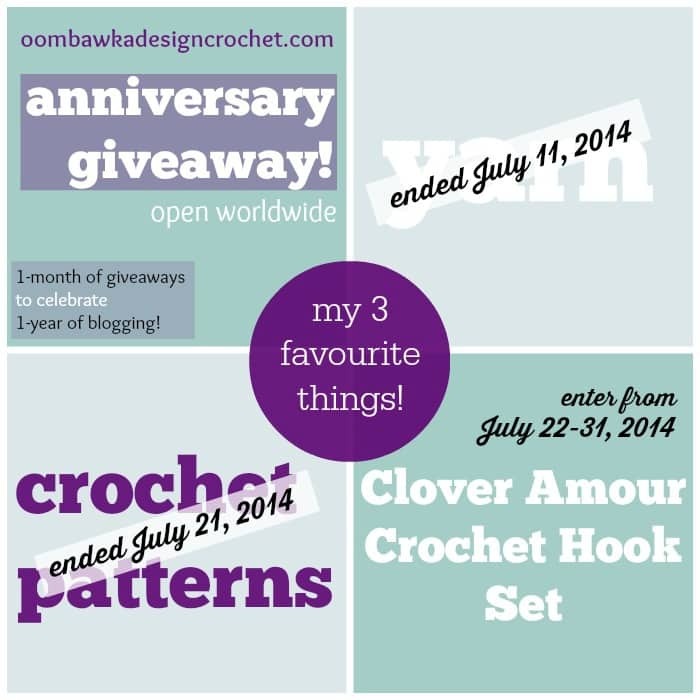 Part 3 – I love Clover Amour Crochet Hooks! To help celebrate my 1-year Blog Anniversary, I have donated a 10-hook Clover Amour Crochet Hook Set. I have developed sore calluses on my thumb and a finger from using the hooks I have. Due to chronic illnesses I can’t work, so I crochet to keep myself sane and try and earn a little money. These hooks would make life easier. I love crochet hooks, especially colorful ones! I would start on a baby blanket for one of my pregnant friends! I would probably make a baby blanket. I do a little crocheting every day, usually something for my little girls. I would probably work on some hats and booties that I’ve been working on for a couple of friends who are expecting! Love your site and all the patterns! Thanks! I love the Chevrons in Crochet! I would crochet an afghan! The first thing i would crochet is a baby blanket!! love making them. one day i will try to do clothing…..
Another one of my favorite patterns is the baby bear hat. it’s so precious! I love your Just Be Happy Scarf, so I would have to find some beautiful yarn to make one of those. Thank you for the chance to win a set of crochet hooks. My favorite FCPF is 50 beautiful blanket patterns. There are quite a few I can’t wait to try. My favorite free pattern is the midnight aura wrap. It’s absolutely gorgeous. Can’t wait to make one! If I won, the first thing I’d crochet would be a new afghan for my living room. Worlds BEST Diaper Cover! Been looking for something like this all summer! If I win these hooks, I’d make an afghan for myself. Or a hat for my kiddos. I love Darla’s bunny hat and the double crochet hats. I like the Rainbow of color, friday set! I like the springtime fingerless gloves! A baby sweater is what I would crochet. Thank You for all the giveaways you have. I also live the free patterns you post…thank you. I like the shell stitches, doilies, and crochet cheat sheet. I need to make a Seahawks afghan for my future son in law. He’s has been whining that I never make him anything. If I were lucky enough to win these hooks, I would make a series of hats using your free patterns. They’d make great Christmas gifts. If I won these hooks, I’d definitely start working on a baby blanket. A friend of mine is due in January! Maybe Savannah’s Baby Blanket pattern? I love your Hope Women’s Hat! My favorite pattern has to be Mommy’s Simply Easy Mittens pattern! So easy and turns out great! Ohhh i just found out this giveaway!!! O would love to win, so I could do more afghans, between my Job, two Kids and my home, crochet is my therapy to stay healthy!!! Thank you!!! Hats…it is getting close to that time of year!!! I have requests for many, many crocheted Christmas presents that it would be hard to choose. I think the first one I am going to make would be a pair of slippers for my sister. She has very, very tiny, hard-to-fit feet and I have a pair that she loves. That way I can make her a pair that actually fits her! Thanks for the opportunity to win and for all your share with us! So winning crochet hook would b great!! I want to make an owl first if I win. I would make dresses for my daughter. I think I would have to say the shark slippers. Thank you for this chance and all the wonderful patterns!!!!! I would be cracking down on making Christmas presents for my eight siblings three sets of parents and my husband and two boys! I would immediately start making dresses for my baby granddaughter for Christmas. I would crochet a gift for my granddaughter. Loving everything I have seen! The Simply Pink Newborn Hat is my favorite pattern! As for what I would make, I would make a cowboy hat and boots set with these comfy hooks!! I would love to make my first ever chevron blanket with these! My favorite free pattern right now is the Just be happy scarf. I love everything about it. As far as what I would crochet with the hooks, I dont know yet, but I would be comfortable doing it, and they would make a great birthday present. I would make a baby blanket for my best friend who is having a grandchild coming in December! If I won the set of hooks, the first thing I would crochet would be a blanket for my two little girls to snuggle under together. They love to cuddle while they watch movies or read books. Happy anniversary!! Thank you so much!!! The first thing I would crochet is a hat for my kids. I’d probably crochet a hat that I owe my friend although I’d really like to crochet a baby dress!!! The first thing I would crochet with thee hokks, would probably be waistcoat stitch potholders. would finish the blanket I have not been able to as my old hooks hurt my hands and wrist to use! I am new to this site and I must say it really looks like fun! might have to go buy a hook or two…thank you for putting this out here for people!! it is GREAT !!! I make lapghans for local nursing homes. I think these hooks would help me be more comfortable and be able to crochet. I love your Simple DC hat in all sizes and want to start making them for winter for the homeless with a matching scarf. I love your designs and your website. I would like to crochet a rag rug! I would make a prayer shawl with these beautiful hooks! I am in love with your Not Another Owl Hat pattern, the Purple friday freebies, and simply love the 5 More and 5 Handy Dandy tutorials!! They are my go to!!! Love all your work!! Thank you for the chance!!! If I won these, I would jump right in and crochet a bunch of Amigurumi’s. As well as a top for myself. Forgot to mention that the first item I would crochet with these hooks is your Crochet Shell Patterns blanket! Love seeing your posts everyday, thanks so much! I would hook up a crochet tote, a basket and a cute amigurumi frog and owl!! Love Clover hooks! I could do so many things, it would be hard to pick just one! I’d love to be able to crochet again and these will help! I don’t have a favorite pattern, tutorial, or FCPF…I like them all! I would crochet the HUGE graphgan that I want to do for my son’s birthday! Would love to get these! Starting to get a bit of arthritis and the large handle hooks definitely make it easier for me. Also, the first thing I’d so with these hooks is work on a scrapghan. I love the way they look, suits my personality perfectly. These hooks are beautiful. I’d love to win a set. My favourite free pattern is the simple double crochet hat (it was my first ever hat and I was so proud of myself) I use this pattern all the time now and just add embellishments to suit the wearers personality. Thank you for the giveaway. I would make dresses for my granddaughters. I love the kelly satchel. I think I might do the Happy scarf. I really love the colors, and the elegance. I would make your messenger bag.You make easy to understand patterns thank you. I would start witha dress for my granddaughter or a shell jacket for myself! Most likely my granddaughter first! I have Sooo Many plans to create from all the wonderful ideas and patterns! Will probably finish my grandson’s baby booties…… then onto shrugs for my daughters and gloves and mitts and hats for the upcoming winter. 🙂 Thanks for all the ideas and patterns! If I won these Clover Amour hooks, the first thing I would crochet would be a reversible afghan for my daughter – one with hearts on the one side – I saw the idea today and it simply rocks!! I love to crochet, despite the fact that I’m a beginner. I’ve found that I picked up on it rather quickly. I would love to have such a nice set of hooks to grow with me! I would probably make some booties. I would make my daughter a blanket. She loves how yarn feels and won’t sleep with anything else. 🙂 Thanks for the giveaway! I love all your designs. Your patterns are so easy to follow.thank you for giving up so much of your time to teach us this beautiful artistic craft. I think all your patterns, tutorials, and FCPF’s are great…cannot pick a favorite! I would love to win these. If I won I make a lapghan because I get easily. Favorite FCPF is the one about the edgings. Favorite tutorial is the invisible seam, it has really helped alot. A nice useful giveaway. Thank you for sharing. Ooohhh I would love to have a set. I will definitely make the beautiful potholders. Thank you so much for sharing this crochet hooks givraway. If I were to win these Clover Amour Hooks the first thing I would make is a pair of booties for my new grandson due in Aug. I love these types of Crochet hooks they help me crochet smoother. Plus these hooks help keep the yarn from pulling apart when crocheting. I really like one of your newer patterns called the “Midnight Aura Wrap”. I love the color you have chosen for this pattern too. I am going to make one out of Red Heart Boutique Unforgettable Yarn in the new Sunrise Color. I would love these hooks! I have a project on the go every day so that I keep myself busy during depression. Thanks! I would love to win these pretty hooks. I always have a crochet project on the go. I “crochet to heal” a lot so I would appreciate these hooks. Thanks. I’d start a granny square jacket for my sister. I would start on my Christmas gifts, beanies, scarves, blankets, etc. Thank you for all the giveaways, and free patterns, I have no idea where to start lol. ONE of my favorite tutorials is the invisible seam/join. Genius! You have so many wonderful free patterns that I can’t choose just one favorite! I have a bag pattern I have been wanting to try so I’d probably do that first. I would use them to crochet everything I make! But I guess the first thing would be the scarf’s I plan to do as Xmas gifts this year. OH and something special for the new grand baby. The crochet hook set is beautiful! I would just immediately switch over all my WIP to using these hooks. A full set basically means I can do anything I want with them! There are so many things on my “honey-do” list to crochet, oh my to choose is hard! I have a friend that wants me to make her a couple of character hats, I would probably do them first! I love these hooks, I have 2 of them but would like to have all. Love, love, love them. I went from the plain jane metal hooks that I think everyone starts out with to these and again, love them! 😉 Thank you for sharing. Definitly a blanket would be my crochet project. The first thing I would crochet if I won this hooks would be the Just be Happy Scarf. My favorite Free Friday Crochet Pattern is Purses, Bags, Totes, Oh My. My favorite free pattern is Just be Happy Scarf. I would make more potholders and boot cuffs. 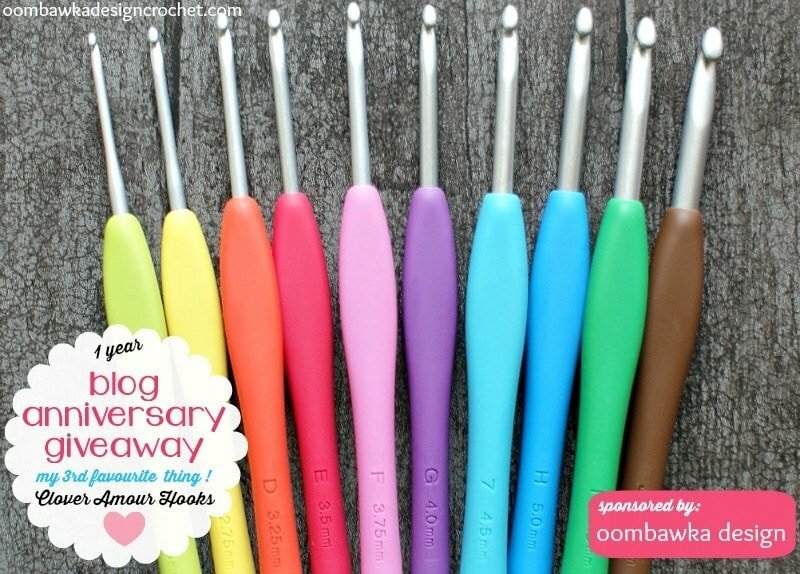 I am sure that I would try quite a few more as well:) Thanks for the opportunity to win these crochet hooks! A matching set of crochet hooks? Not in my wildest dreams! ha, ha. These look fantastic! My favorite fcpf so far is edgings but really, I love em all! I would definitely want to get a jump start on Christmas presents with these hooks. The midnight aura wrap is one of my big favorites of yours. Thank you for doing this giveaway!! a baby blanket for my new g-baby on the way, and some hats, gloves, and scarf for my mom who is always freezing! There are so many projects in my to do list. Dresses for each of my girls and a top that I’m very much looking forward to crocheting for myself are up the top of the list at the moment. I think a hippo hat is next on my hook! LITTLE FRIENDS FOR LITTLE HANDS is the one I like on FCPF… saw no where on that post to comment so commenting here. I FEEL PRETTY – WOMEN’S CROCHET HAT is so beautiful! If I was to win this giveaway, I would use these awesome hooks, to continue my crocheting for our awesome charity Hats For Justyce!! We currently make hats for preemie to adult, blankie buddies (lovies) for our local police and fire stations, bed dolls to raise money to continue funding the supplies, and we about to start making seat belt covers that will go to our local health department because they give our free car seats and booster seats. We then have a goal of 1000 hats, bed dolls, and blankie buddies (added up together) to be taken to our local Salvation Army for their Christmas Giveaway Program for next year 2015. I would make a beannie, or perhaps a baby blanket, or a dress, or… I don’t Know!! There are so many things I want to make!! Thanks for this opportunity!! I love your Mya’s baby blanket. It is amazing!! I would love to crochet a pair of finger less gloves or a ripple blanket. My favorite tutorial is the invisible seam one, and I’d make myself a blanket first thing if I won the hooks! Everything I’ve made so far I’ve given away. My favorite FCPF is the edgings one. Always looking for pretty ways to finish projects. The first thing I would make would be dishcloths and washcloths! They are my latest kick! Thank you for the opportunity! I would finish my queen size afghan. With wrist issues these would help. Thanks for a wonderful giveaway. I am working on newborn hats and rainbow blankets for family gifts right now. I imagine I may have a hook stuck in several different projects! I love to crochet and usually have a couple projects going a one time. A small one to carry with me and a larger one for working on at home. I would certainly like to try using these new hooks. I just love the owl hat! If I won these hooks I would be able to crochet more than I do now so my hands won’t hurt. I would make a big afghan! If I won these hooks I would make fabulous items to sell. I would make a baby bonnet. I think these would be great to use with my hand issues. Thank you for the opportunity. I love the newborn baby bear hat! Love your blankets and caps. I made a few of them for my son as well as my friends twins 🙂 she was so excited by looking at them .. The most adorable owl hat thats on your free patterns! Its too cute! I have some yarn ready to start a sweater for my son, a new hook just might give me the motivation to get started. Maybe an Afgan depending on what catches my fancy at the time! If I won, which I won’t, but you have to try 🙂 I would make shark slippers for my newest grandson as my first project. Thank you for the giveaway! If I won, I would crochet a set of dishcloths, a wine tote, and a couple dish towels!! Thank you for the opportunity!! 1. I love so many of your free patterns…too hard to choose a favorite! 2. My favorite FCPF is the 30 Free Crochet Edgings. 3. My favorite tutorial is How to Make a Pom Pom. 4. If I win, the first thng I’d crochet is the edging for a baby blanket I’m making. The first thing I would make would be a new dream catcher for my bed room. After that, the sky is the limit. My first Crochet project i would make if i win this great set of hooks is the Summer Lovin Racerback Tank Top from two brothers blankets. Because i need the 5,5 mm hook 🙂 Don’t have all the sizes yet. So its gonna be used a lot if i win this great price!! I would crochet a pair of bunny slippers, baby sandals or a hat first with these awesome crochet hooks! I am disabled with RA and crochet whenever my symptoms let me! I would crochet everything and anything! If I won these hooks, the first thing I would make is the baby gift for my husband’s colleague. He and his wife are expecting their first child at the beginning of Sept. I would crochet a lapghan which I can use while working. I would use the hooks to crochet cotton headbands and flowers for a market that i will be at in September. If I was to win these hooks I would use them to make new winter hats for my four kids. Especially a teddy bear hat and purple minion hat for my two year old. He makes minion noises when he watches the movie. My favorite Crochet Tutorial is the Five Handy Dandy Crochet Tutorials You May Just Want to Save for Later! I would use the hooks like I do my everyday hooks. I actually have a “knock off” version and I love them. I can only imagine how much better they are. My favorite FCPF post is the May 30, 2014 post (30 Crochet Dresses for Little Girls). My favorite of all your free patterns is the Not another owl hat pattern. I would love these as I hear they are good for people with hand problems! So the first thing I would try is amigurumi crochet! Thank you for the opportunity! I would crochet a messenger bag for my daughter to use for her flute supplies. I would crochet a nice set of race car slippers for a friend’s crazy little car-loving boy.